Debridement is the process of removing unhealthy tissue from the body. The tissue may be necrotic (dead), infected, damaged, contaminated or there may be a foreign body in the tissue. For example, a patient has a serious wound that is infected and is not getting better with antibiotics and wound care. The wound is getting larger, the patient is getting sicker, and without better control of the infection, the patient could be in a life-threatening situation. For this patient, surgically cleaning the wound and removing some of the dead and infected tissue may mean that the body can fight the infection and heal the wound more easily. With the dead tissue removed, the healthy tissue that remains is more likely to remain healthy and not become infected. A wide variety of debridement techniques are used in medicine, and for a severe wound or a wound that has difficulty healing, multiple types of these treatments may be used. For example, a serious wound with necrotic (dying) tissue may first be treated with surgical debridement but may have enzymatic and mechanical debridement in the following weeks. Surgical Debridement: This is the process of removing damaged or dying tissue surgically. In this case, a surgeon visually inspects the tissue, determines what tissue is viable, and removes the tissue that is not salvageable. The bad tissue is literally being cut away using a sharp instrument or heat, with the surgeon trying to preserve as much good tissue as possible. Autolytic Debridement: This is the body's own process of getting rid of dead tissue and keeping healthy tissue. This process may be assisted by a dressing or wound care, but this type of debridement is essentially standing back and allowing the body to heal itself. Enzymatic Debridement: This type of debridement uses enzyme solutions or ointments to treat the tissue. Typically, the solution or ointment is combined with a dressing that is changed regularly, which softens the tissue and allows for the bad tissue to be removed when the dressing is removed. Mechanical Debridement: This form of debridement is the removal of tissue using a dressing that is changed regularly. The dressing commonly referred to as a wet to dry dressing, consists of moist gauze being applied to a wound that requires debridement, which is then covered with a sterile bandage. After a set period of time, the dressing will dry out, which allows the tissue to adhere to the gauze. When the dressing is removed, the tissue that adhered to the gauze is also removed. This type of debridement is also referred to as "non-selective debridement" as both healthy and unhealthy tissue can be removed with this process. Maggot Debridement: This type of debridement uses maggots, or fly larva, that is raised in a sterile environment to debride wounds. The maggots are placed on a wound, typically under a loose bandage, where they eat dead or dying tissue. Maggots are a selective type of debridement, meaning they only consume unhealthy tissue, leaving the healthy tissue undamaged. Hydrotherapy (Mechanical) Debridement: Hydrotherapy, or pressurized water, is most commonly used to debride burn wounds. A non-selective form of debridement, this treatment can be very painful, depending upon the nature of the wounds. The process of debridement ranges from a minor annoyance to very painful. Depending on the type of debridement performed, the nature of the wound and how serious the wound is will dictate what kind of pain relief will need to be provided prior to the procedure being done. Some procedures will be done without any intervention for pain, while others will require anesthesia so the patient will not be aware of the procedure being done. While anesthesia is necessary for severe cases, pain medication taken by mouth is typically more than adequate for most of the gentler types of debridement and in many cases, pain medication will not be necessary. Debridement is often a necessary evil; while it can be painful, many wounds will not heal without this essential process. 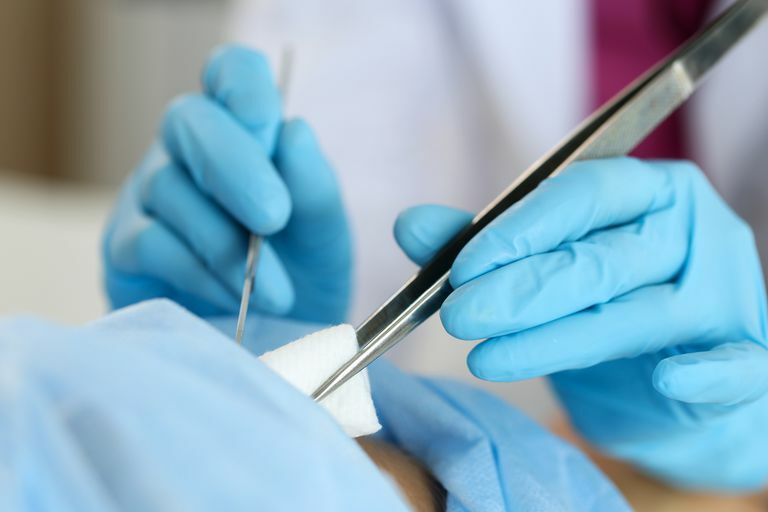 If you have a wound and debridement has been recommended, it is important to learn as much as you can about the debridement process, and don't hesitate to obtain a second opinion if you are unsure about what type of procedure would be the best for your unique situation. Take the time to ask questions about the options that are available, the cost of those options, and most importantly, which type of debridement will be lead to the best healing from your wound.